Millet capsicum rice is a simple millet recipe with Italian spices and colored capsicum. 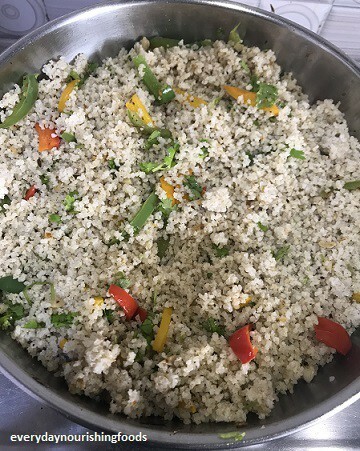 This is a vegan, gluten-free and healthy recipe made with little millet which will be good for breakfast or for lunch box. Other small millets like Foxtail, Proso or Barnyard millet can also be used to make this recipe. I have posted a detailed recipe on millet nutrition and how to cook the fluffy millet here. 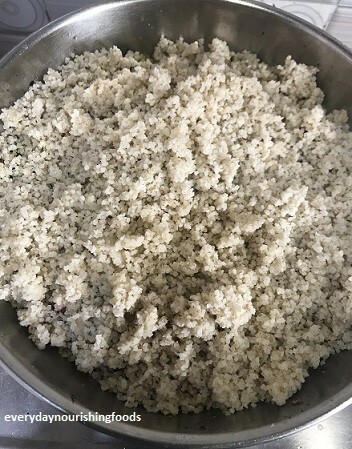 Cooked millet can be used to make any rice dishes. 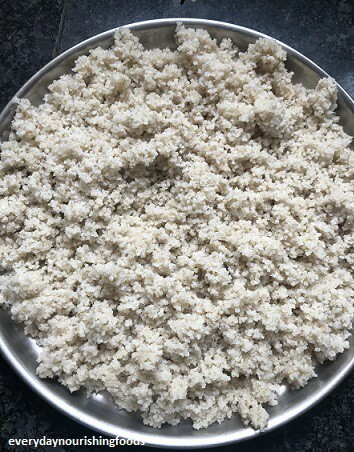 Lemon rice recipe with foxtail millet is here. Cooked little millet flavored with Italian spices and capsicum. Cook the millet and keep it aside. I have posted a separate post on how to cook the fluffy millet. 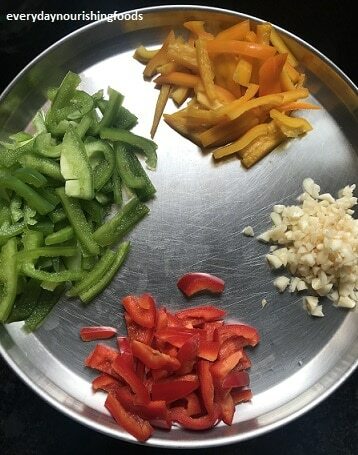 When millet is getting cooked, chop capsicum into thin slices. 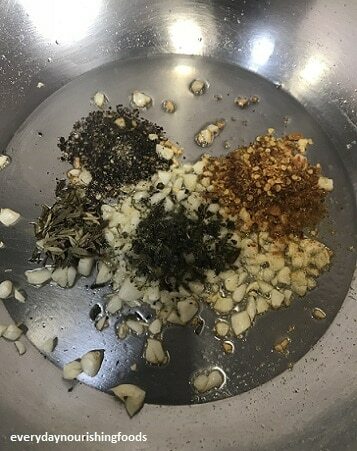 Finely chop garlic as well. I haven't added onion, you could add finely chopped onions as well to this. Heat a pan and add oil. Once the oil is heated, add finely chopped garlic. Now add red chili flakes, dried thyme, dried oregano and black pepper powder. 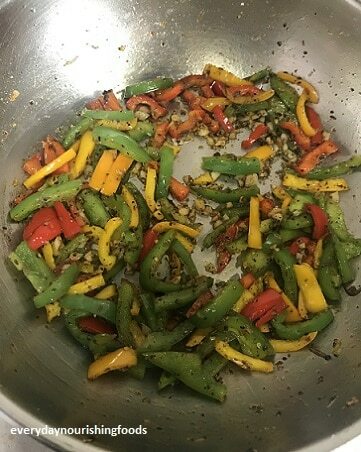 Add chopped capsicum, salt and mix everything. Let it cook on high flame for 5 minutes. When cooked on high heat, capsicum will retain the crunch and yet cooked inside. Add cooked and cooled millet and mix everything well. Adjust salt if required and let it heat for 5 minutes. Switch off the flame and add chopped coriander leaves. 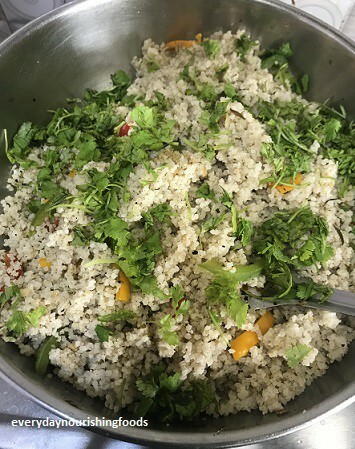 Mix everything well and Capsicum rice is ready to serve! Cook the millet and keep it aside. You can see detailed instruction on how to cook fluffy millet here. 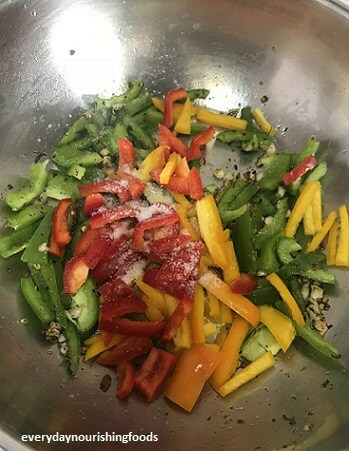 When millet is getting cooked, chop capsicum into thin slices. 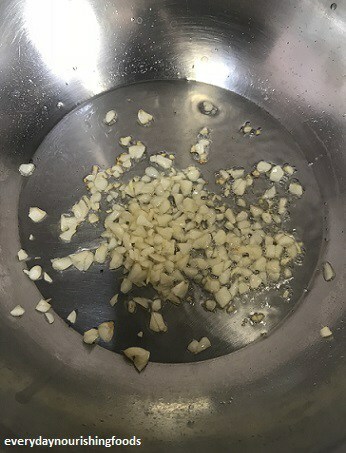 Finely chop garlic as well. I haven’t added onion, you could add finely chopped onions as well to this. Now add red chili flakes, dried thyme, dried oregano, and black pepper powder.